By Sunday of this last week, I had read 100 pages of John Steinbeck’s opus, East of Eden, and I wasn’t sure if I wanted to continue. It wasn’t the size of the book. It was the casual misogyny. I wasn’t in the mood to read books about men when women were dismissed or villainized (no matter how rightfully). But I stuck with it. My dimly remembered memories of The Grapes of Wrath plus a friend’s comment that East of Eden was one of his favorite books kept me going. I’m glad I did. I was moved more than once by this novel about the struggle of human nature between good and bad. 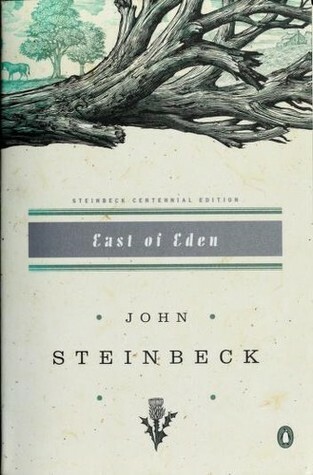 East of Eden is the story of two families, narrated by a young man named Steinbeck. (Some of the characters are based on members of the author’s family.) We meet the Hamiltons first. They are a sprawling family who live and work on a hardscrabble ranch near the Salinas Valley in California. Though they have a lot of ingenuity, they can never seem to get ahead. The other family, who we meet after many, many pages, are the Trasks, who eventually take over the narrative. The Trasks—first Adam and his brother, Charles, and then Adam’s sons, Aron and Caleb—are written about in epic terms as they wrestle with jealousy and love. Their struggles are magnified by the appearance of the sociopath, Cathy Ames, who often steals the show. Because East of Eden was written and published in the mid-twentieth century, there is a lot of casual misogyny and racism. One of my favorite characters, Lee (who works as Adam’s servant and caretaker, and who essentially raises Adam’s twins), is frequently subjected to racial slurs even though her arguably the most intelligent character in the book. Outside of the Tracks and Hamiltons, no one is willing to see Lee as anything other than a word I will not even write. Women characters, apart from Cathy and Abra (Aron’s love), aren’t given much more attention than a few pages or, sometimes, just a few sentences. There is more than one passage where a woman is admired for not talking. There are others were women tell a man what they want, only to be told they are silly and have their wants dismissed. It’s hard for me to read these parts, and part of why I was half-willing to just give up. Partway through the novel, there is a passage where Lee introduces the concept of timshel*. This was my turning point. Lee was bothered by a word in Genesis that led readers to believe that being good or bad was predestined. If being a good or bad person is predestined, what is the point of trying, he wondered. So Lee worked with a group of Chinese elders to learn Hebrew and re-translate the passage. The elders concluded that the word in question actually meant that the struggle between good and bad is a choice that we humans have to make over and over again. We’re not doomed by our parents’ histories or DNAs. We’re not even doomed by our past actions (if we can atone and forgive). Instead, we can grow over time into the kinds of people we want to be. The concept of timshel moved me a lot, and I sympathized greatly with Caleb, who wrestles with his conscience and his occasional inclination to hurt others when he himself is hurt. East of Eden is a great book. It’s an epic full of plenty of fodder for the brain. It is also a work of its time, with attitudes and words that we find offensive now. I had to find a way past the latter to enjoy the former. Other readers may not be willing to make that compromise and I think this is totally fine. There are too many books in the world to struggle through a book just because of its reputation. Readers who do choose the take on East of Eden will be greatly rewarded by a complex, thoughtful, very human story of men whose struggles and failings are literally writ large for us. There are definitely reasons why this book was and is a classic of American literature. * If you google “timshel,” you get articles about the concept, lyrics to a Mumford & Sons’ song, and a lot of great tattoos in English and Hebrew. 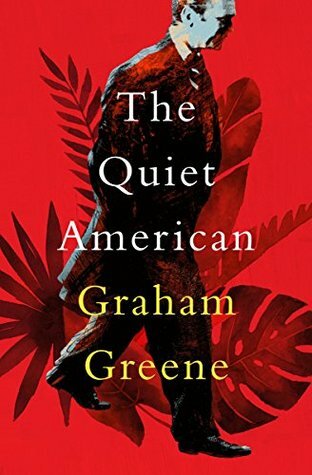 Graham Greene’s masterly novel, The Quiet American, is the kind of novel that I find impossible not to read as an allegory. In this brief, devastating novel, two men—one British and one American—fight for the affections of a Vietnamese woman without really considering her wishes or feelings. The woman rarely gets to speak while the two men debate what’s best for her and her country in either deep cynicism (the Briton) or naive idealism (the American). This novel is not just allegory. It is also the story of a man wrestling with his conscience and his long commitment to neutrality, which is harder to maintain as conditions grow more violent. The Quiet American is set in the mid-1950s in Saigon (now Ho Chi Minh City), when the French were still fighting to hang on to their colony and Americans were just barely getting involved in the escalating conflict. Thomas Fowler has been in the city for two years, working as a reporter for a British newspaper. He is content. He has a mistress, Phuong, who cares for his needs. His job is not difficult, as much of what he writes is delivered and press conferences and anything controversial is censored before it leaves the country. The French regime is beginning to crumble around him, but Fowler isn’t worried about much. (The opium might be helping with that. It’s hard to say for sure.) The arrival of American Alden Pyle throws Fowler’s carefully maintained status quo off its axis. Pyle decides, after one meeting, that he is in love with Phuong and is determined to marry her. Pyle is a fascinating character. I’ve met cynical, detached-but-sensitive characters like Fowler before. I’m comfortable with his blasé view of the political and social landscape. But Pyle is another story entirely. Pyle comes straight from Boston, armed with books by armchair political theorists who tell him that Democracy is something everyone should have, especially when Communism is lurking about. If asked, I don’t know that Pyle would be able to give clear definitions of either. He’s been taught that Democracy is the ideal and the Communism is evil. Even when he’s confronted with evidence that the situation in Vietnam is complicated and that his version of Democracy is just a different flavor of colonialism, Pyle refuses to learn. Pyle horrified me as often as I pitied him for his rigid world view. The Quiet American has been on my to-read shelf for a long time. It’s been lauded as a mid-twentieth century classic and I am happy to report that it absolutely deserves its reputation. It hasn’t lost any of its punch in the sixty-four years since it was published. Its commentary on imperialism, interventionism, paternalism, and independence are just as effective (and important) as they were in 1955. I strongly recommend this for historical fiction readers who like books that carry a timeless message. Even for readers who don’t want too much moralizing, this novel is a brilliant study of two men in a foreign country who approach life from very different angles. The Quiet American, if nothing else, is a terrific read for its depiction of what happens when pragmatism and idealism collide. I picked up The House of the Seven Gables, one of Nathaniel Hawthorne‘s best known novels, on a whim as I was looking for something creepy to read for Halloween. The novel isn’t terribly frightening, but it does offer some chilling moments as the narrator shows us the dark secrets and strange personalities of the Pyncheon family. This family is in serious decline by the time we meet them, which they and the other people in the town attribute to a very ugly land dispute-turned-witch hunt near the end of the 1600s. The novel treads the line between supernatural horror and psychological horror. Even at the end, it’s hard to say whether or not the Pyncheons really were cursed by a wronged man or by their own greed. The first two-thirds of The House of the Seven Gables read to me like a very long set up. The first chapter, written in the first person of a narrator who later retreats into the third person, explains the history of the eponymous house*. In the late 1600s, one Colonel Pyncheon took advantage of the witch hunting frenzy to frame a man who owned some land the Colonel wanted to build on. Even at the time, his fellow accusers were suspicious of how the Colonel went after Matthew Maule, but didn’t stop him from sending the man to his death and claiming the land. On the day that the Colonel celebrates the completion of his house, he is found dead in his own study, having apparently choked on his own blood. After that thrilling build up, the novel cools down. More than 100 years after Colonel Pyncheon’s death, a country cousin named Phoebe takes up residence in the House of the Seven Gables with the spinster Hepzibah Pyncheon. Hepzibah has just opened a cent-shop to save herself from complete poverty. (A cent-shop seems to be something like a convenience store, a little shop where the neighbors can stop in for a bit of flour, yeast, or odds and ends and local children can grab a cookie or two.) Phoebe turns out to be a godsend for Hepzibah, who holds on to the remnants of her gentility with both pale fists. Phoebe cooks, cleans, helps in the store, does the accounting, and basically puts things to rights. She even cheerfully soldiers on when Hepizibah’s brother, Clifford, a strangely affected man who has just gotten out of prison, returns home. The action only picks up again after Phoebe has to make a brief trip back to visit her mother in the country. Almost as soon as she’s gone, Hepzibah and Clifford’s other cousin, the sinister Judge Jaffrey Pyncheon, shows up to try and badger proof of the family’s legendary “Eastern Claim” out of Clifford. Things go rapidly to hell, especially when the narrator delivers a stream of consciousness dialogue with Jaffrey during the tensest part of the novel. The first chapter and the last ones are the best parts of The House of the Seven Gables. The bulk of the book, when things are kept well in Phoebe’s capable hand, are almost pastoral except for the occasional gruesome story about her ancestors and the odd disembodied voice to liven things up. The House of the Seven Gables is a curious reading experience. It surprisingly readable, considering how dense The Scarlet Letter is. It’s written in contemporary (c. 1850) American English, but it definitely takes the long way around to get to its conclusion. There were times when I wondered if the book would ever deliver on the promisingly creepy setting and characters. I think I would have enjoyed this book more if I hadn’t read any descriptions at all and just let the narrator take me where they would. The ending (which is pretty great) would have had an even bigger wallop. Still, I’m glad I read it. I feel like I just filled in a gap in my knowledge of American classic literature even if I didn’t get the kind of thrill I was hoping for. * The House is still standing in Salem, Massachusetts. You can visit. Originally published in 1929, Berlin Alexanderplatz, by Alfred Döblin, has been newly translated by Michael Hoffman and published by the New York Review of Books press. This novel is a classic of German literature for its portrayal of Weimar-era Germany and its use of sound effects and other cutting edge (at the time) writing techniques. I marvel at Hoffman’s ability as a translator because he was able to translate a lot of the weirdness so that it made sense, while preserving Döblin verbal fireworks and the central tale of Franz Biberkopf’s trials and tribulations. The novel opens when Biberkopf is released from Tegel Prison. He has just finished serving four years for beating his girlfriend so badly she died of her injuries. I was never able to forget this fact in spite of the novel’s attempts to get readers to sympathize with Biberkopf. And it certainly does try. Over the course of the novel, Biberkopf gets tangled up with criminals more dangerous and intelligent than he is, only to suffer the consequences (which include losing his right arm after his nemesis throws him out of a moving car). He wants to go straight but, in the late 1920s, there are few options for a man with no skills, a violent temper, and lacking in the brain department. It’s really just a matter of time before he ends up dead or in prison. The only mystery is how that happens. There are frequent references to Job, the Whore of Babylon, and Death (who does make an appearance late in the novel) that reminded me of old medieval Everyman plays—though a lot dirtier. In the Everyman-type plays, an ordinary man seeks heaven or atonement while life and fate through everything they can at him to try and knock him off the straight and narrow. Without these references, Biberkopf’s story is rather sordid. I mean, it’s sordid anyway, but the references force us to take a step back and think about what we might have done in Biberkopf’s shoes. Would we have been able to go straight with a criminal record and no trade? The closest Biberkopf gets to making legitimate money is selling copies of Völkisher Beobachter, a Nazi newspaper. I was entertained by the openings of the chapters that seemed to be taken straight from the front pages of the many newspapers referenced in Berlin Alexanderplatz. While Biberkopf gives us a view of his little corner of criminal Berlin, the excerpts give us a better look at a vibrant city with all sorts of ventures in the offing—they also show us many stories of people reinventing themselves only to be exposed, providing frequent doses of foreshadowing for Biberkopf. These snippets might have been my favorite part of Berlin Alexanderplatz, given my dislike of Biberkopf and the portrayal of the women as hysterical dupes who, for some reason, work to support men like Biberkopf who just mooch off of their earnings. In translating the word salad that is Berlin Alexanderplatz, Hoffman used low class London accents to try and capture the flavor of Biberkopf’s criminal acquaintances. In fact, there are parts that are translated as “Leave it aht.” I understand why. More English speakers are familiar with how low class Londoners sound—at least from the movies—than they would be with how low class Berliners would’ve sounded. But this struck me as odd more than once as I made my way through the book. I kept forgetting we were in Berlin in 1929 until someone mentioned marks or the litany of S-Bahn (tram) stops started up again. I can’t fault Hoffman too much; this book must have been a monster to translate. Even though it was a challenge and I hated the protagonist, I’m glad I decided to read Berlin Alexanderplatz. It really does capture a time and a place that was definitively lost a few years after the book was published. More than that, the Weimar-era is a time and place that personally fascinates me because it gave rise to Hitler and National Socialism. There are hints of what’s coming in this book, but the sense I got was that everyone seemed like the party and the liberties would continue forever—except for the doomed Biberkopf, anyway. The divide between country and city is a popular trope in Russian fiction (at least as far as I can tell with the handful of Russian novels I’ve read). City people believe themselves to be more cultured and intellectually sophisticated than their rustic countrymen. The country people are baffled by the affectations of the urbanites. I hadn’t seen any stories take on these assumptions until I read Sofia Khvoshchinskaya’s Country Folk and City Folk (translated by Nora Seligman Favorov). This comic novel—reminiscent of Jane Austen and flavored with the usual Russian philosophizing—takes place around 1860 in the provincial town of Snetki. A trio of Muscovite aristocrats descends on Nastasya Ivanova and her daughter, Olenka and try to manipulate the “bumpkins,” only to realize that these country folk have their share of common sense. Nastasya Ivanova and Olenka are quite different from each other, though they are an affectionate pair. Nastasya is accommodating and frets if she thinks she’s failed as a hostess and gentlewoman. To Olenka, everything is a joke and she rarely shies from saying exactly what she thinks. They’re cheerful enough living on their estate until Anna Ilinishna, Erast Sergeyevich Ovcharov, and Katerina Petrovna Dolgoroskaya turn up in Snetki. Anna wants a free place to live while she waits for the princess she was living with to realize her mistake in turning Anna out. Anna is a “holy woman,” an exceedingly pious woman on the surface but a con artist underneath. Erast Sergeyevich, on the other hand, is a bit more honest. He also wants accommodation, having run through all his funds and learning that even the manor house was dismantled and sold off. Both Anna and Erast find a place to live. (Erast rents the newly built bathhouse.) Katerina Petrovna wants to marry Olenka to Semyon, Katerina’s lover, so that Semyon can have an income and a reason to stay in the country. Olenka is wise to all of these schemes pretty much from the start, but it takes Nastasya a while to stop trying to see the best in these exasperating people. It also takes a while for the action in Country Folk and City Folk to get rolling. Erast is given many opportunities to embarrass himself at the beginning of the novel. To Russians, I suppose, Erast is a hilariously incoherent social philosopher but I was rolling my eyes hard along with Olenka. When the manipulations start in earnest, I saw a lot of similarities to Austen’s comedies of manners as characters schemed to win over opinions and maneuver people all over the place. I requested Country Folk and City Folk from NetGalley because I’ve been keen to read another female Russian writer ever since I read Teffi’s Memories. I’ve really enjoyed reading another side of Russian literature: comical rather than depressing, lightly social rather than heavily philosophical. I’m very glad Columbia University Press published this novel, which was previously unavailable in English. It’s a wonderful read for its sarcastic honesty and the way it turns old stories inside out. I received a free copy of this book from NetGalley for review consideration. It will be released 15 August 2017. Young adult literature has changed profoundly over the past century and a bit since Little Women, by Louisa May Alcott, was written. While modern young adult literature encourages readers to stand up against tyrannical governments, experiment with relationships with vampires, and navigate the darker sides of life, Little Women is part and parcel of how literature for minors used to show youngsters the benefits of following tradition and being a good Christian. There are some parallels in terms of doing the right thing even when its hard, but books like Alcott’s are difficult to read in this age because the characters are just so wholesome. The first half of Little Women is the one most familiar. In it, we are introduced to the four March girls, each with their particular vanities and quirks. Apart from the saintly Beth, each one is encouraged by their mother (who speaks mostly in parental lectures) to work on their character defects. Jo is too boyish—wild, messy, inclined to pull pranks, etc.—and has a temper that frequently flares up. Meg is too fond of material comfort and wealth. So is Amy, but Amy is also vain about her appearance. Some of these flaws are genuine concerns, but I was uncomfortable with the way the girls were taught to strive to become the Victorian ideal of wife and mother. Meg and Amy come the closest by the end of the book. Jo preserves some of her delightful eccentricity, but even she becomes a somewhat idealized wife and mother. The half of Little Women reads like an extended epilogue in which we learn about what happens to the girls as they grow up, after their father returns from war and Beth fails to die of scarlet fever. (Beth’s death is completely different in the book.) It’s episodic and has little of the depth of the first half. We see less of the characters struggling with flaws and more hearing them talk about it, giving the appearance of summary rather than development. I can’t help but be a product of my own time. I suspect this is the big reason why I dislike Little Women so much now. I’ve been taught about the virtues of individuality, how women have been culturally oppressed for centuries, and the myth of the friend zone. The narrative pushes its mid-nineteenth century values and morality through the characters and onto the reader. (I daresay readers in another century will say similar things about contemporary young adult fiction.) There are moments—usually when the girls are allowed to be themselves—that I enjoyed. For these moments, I think Little Women remains a classic that readers will look on fondly—but maybe shouldn’t reread after they’ve gotten a degree in literature. Christopher Morley’s Parnassus on Wheels is a delightful novella about two oddballs who fall in love over books and light adventure in the early twentieth century. It’s a perfect book for bibliophiles, especially if they want something that has a happy ending (unlike my beloved The Storied Life of A.J. Fikry). Spinster Helen McGill is fed up to the teeth with her writer brother’s peripatetic ways—and with being treated like his servant. So when Roger Mifflin rolls up in his mobile bookstore, Parnassus on Wheels, it seems like the perfect chance to have a bit of adventure to Helen. She writes out a check for $400 and buys Mifflin out, thinking to sell the bookstore on when she’s done with it. Mifflin accompanies her to help her learn the ropes, though it’s clear early on that both have lived very solitary lives and are lonely. All through the book are Mifflin’s monologues about the magic of literature. Mifflin is an evangelist for the written word. The adventures start when Helen’s brother returns from his latest walkabout and starts making trouble, thinking that Helen has been tricked out of her money. After that, it’s one scrape after another for the odd couple. They face hobos, lost horseshoes, money troubles, weather, and more.Though he plans to leave Helen to her journey, Mifflin never quite gets around to it and is always popping up just in time to help. If the love of literature wasn’t enough to hook me, I would have enjoyed this book about two weirdos finding one another when they thought they couldn’t meet someone who would look past their outside appearances and eccentricities. Parnassus on Wheels is a joy to read. This book is freely available from Project Gutenberg.